The museum, being a staff of two, could not operate without its volunteers. Below you will discover the various volunteer opportunities that exist at the museum. Fill out the form to the left or stop by the museum anytime to sign up to volunteer! Docent (training provided) A docent interacts closely with the visitors, welcoming them to the museum, guiding them through the exhibits, and discussing relevant themes and topics covered in the museum narrative. If you love talking to people, they will love talking with you at the museum! Sawyer (training period required) The workers in the sawmill share four important jobs: one handles the saw and turns logs, one handles the logs, one takes the lumber off, and one watches the machinery and helps as needed. 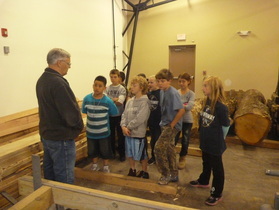 The Sawmill Museum requires that a new sawyer volunteer become a part of a team and work with them, learning the skills and procedures on the job. A great opportunity to learn a new/old skill! Exhibit Construction Crafty people wanted. The exhibits that will be installed in the museum over the next several months and years will be constructed by many volunteers and local companies. If you like to paint, nail, glue, draw, cut, wallpaper, hang pictures, or many other tasks – we want you! Education Program Activity Leader (PAL) (training provided) Students come to the museum from all grades and schools. The PAL teaches a hands-on activity or lesson to small groups of students. This is informal learning at its best. If you love to teach and want to volunteer a few hours each month, this classroom is the most! Researcher Every fact, picture, quote and comment used in the exhibit must be found, checked and double-checked. If you love libraries or are fascinated ferreting out tidbits of information, this is the opportunity for you! Collection Care Do you love “stuff”? Is Antiques Roadshow one of your favorite shows? Then Collection Care is the place for you. This committee receives the donations, decides if they fit our mission, get them ready for exhibit or storage. You will find, clean, label, store, stack, photograph and repair “stuff”. Computer Data Entry (training provided) The museum world, like all others, is busy keeping up with the 21st century. We keep a data base of visitors, donors, collections, exhibits, and many other records. If you like working independently this is the spot for you. Lumberjack Festival (Special Events Volunteer) On July 14th we will hold the 2nd Annual Lumberjack Festival at the Sawmill Museum, Clinton Iowa! If you would like to help out for a few hours that day, or get in on the planning of this fun and exciting event, we need you! Enthusiasm required! Grounds and Garden The Sawmill Museum is putting in a garden to teach about the social history of 19th Clinton. If you would like to garden or care for the 9 acres of ground, we would welcome your help.